My second response was to flashback to the days when my now seven-year-old son Bobby was very young. He has Down syndrome and was born with a serious heart condition that required multiple surgeries. 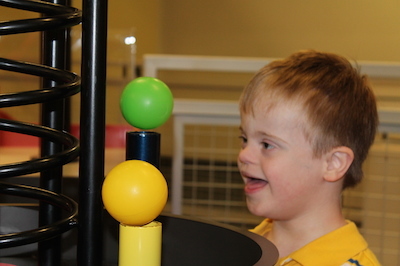 The medical issues left him far behind most of his peers with Down syndrome, so in those early years, I believed every activity I did with him must be structured therapeutic time. I was obsessed with closing the gap, and spent the day attempting to mimic the exercises his professional therapists did with him. My “all therapy all the time” model was an absolute failure. Because his core strength was so poor, Bobby quickly tired of physical activity. His heart condition made him intolerant to the heat and he would wilt after thirty minutes outside in 85-degree weather. The physical exhaustion made other therapeutic tasks nearly impossible. Because he is an only child and because I was engaged with him in every activity, he spent zero time playing independently. He demanded my help every time he encountered an obstacle. It was not good for him and, frankly, I quickly burnt out. So I budged from my “all therapy all the time” model and focused more on just doing things that Bobby enjoyed. Not only did this give me a happier child, but this style has also actually had much more therapeutic benefit than when I stuck to the rigid schedule. In summer, we often head to the playground early in the day. Twenty or so minutes on the swing produces an engaged, alert boy. We also reinforce skills like turn taking and sharing. Because of his heat intolerance, we frequent local museums like the nature and children’s museums. We buy annual passes so there is no pressure to see everything in one visit. Sometimes Bobby just runs around the museum and I count that as good exercise. Other times he and I explore the interactive exhibits together. At home, I keep busy with chores around the house. One of two things happens–he wants to help and we learn practical skills, or he gets bored and makes up his own game. Both have value. Bobby also gets professional therapy several times a week. Our therapy choices are very much made with an eye towards fun. Physical Therapy takes place at a gymnastics studio. For the summer, his speech therapy will involve public outings, like trips to the park and zoo. And, yes, we have time each day where he plays on the iPad or watches Blue’s Clues on TV. Screen time is a break for both of us, and that alone has merit. But even this downtime stimulates him to talk or sing along with the program. All of which gets me back to my initial point: all music is therapeutic. And so are all activities. There is no need to force the issue.